"You may not be where you thought you wanted to go, but you will end up where you need to be if you keep your eyes and heart open to new opportunities!" "I came in undeclared, but I've always loved reading and writing. I've always been very dedicated to my studies, but English was my strongest. I won the senior English department award graduating high school, and it's always been an interest and a passion. Even as a third grader I wanted to write a book and be an author, but coming to Miami I still wanted to explore all kinds of interests before I locked into one. "So during freshman year I got involved in the Choraliers women's choir, the Miami Ballet Corps, The Miami Student, all right away, trying to throw myself into things. It was definitely an experimental process, but at the end of the day I realized that I loved reading and writing. I told myself, 'This is what you've always loved, so trust that this is what you should do.' From there, it also made me see that I want to teach as well, so I am planning to go to grad school for a PhD and become an English professor." 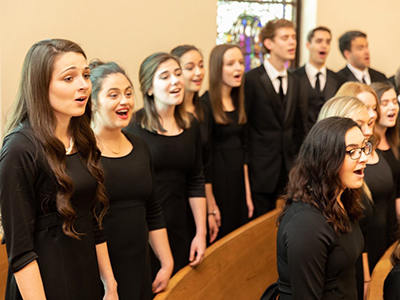 Ellen Stenstrom (left) singing in Miami's Collegiate Chorale. "At the end of my freshman year, I applied to a student organization but was rejected, so I decided to apply to be an undergraduate associate (UA) for the UNV 101 first-year experience course. I ended up getting placed with Gwen Fears, the associate dean of students, and this was the turning point of my Miami college experience. "During our training, Gwen explained that she focuses on her mission by thinking about her 'why,' as in why you do what you do. She asked me why I was doing the UNV 101 program and what I wanted to get out of it, and I told her my frustrations with college so far. She explained that she had been in a very similar situation as an undergrad, and we really clicked. She gave me opportunities to help her prepare lesson plans, lead my own classes, and get involved in mentoring students. She is an incredible, powerful, inspiring woman who emulates what I hope to be as well. By far she has been my most influential Miami mentor — almost like my second mom away from home! 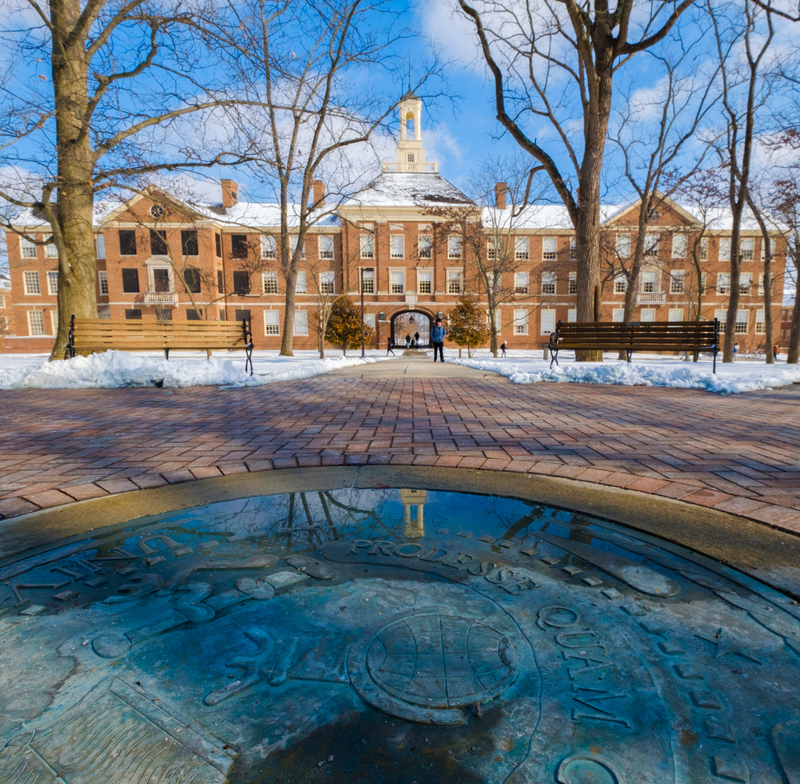 "The value of Miami's undergraduate research cannot be overstated. Coming here I didn't know you could do research in the humanities, let alone in literature. As an incoming student I attended a lecture that explained how to get involved in humanities research, and that became a major goal for me from then on. 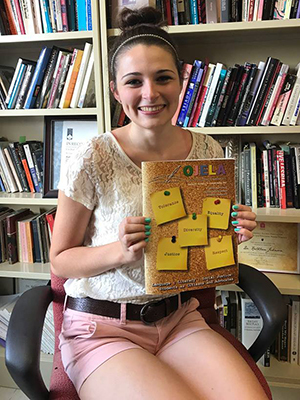 "Last summer, working under my faculty mentor and associate professor Erin Edwards, I won an Undergraduate Summer Scholars (USS) grant for my project, 'Reconsidering the Unreliability and Treatment of Mentally Ill Narrators.' This paper examines modern and contemporary women's narratives about experiences with mental illness, as well as the narrative theory of the terms reliable/unreliable narrator and how we use those terms in regards to narrators with mental illness. It was recently accepted for me to present at the American Culture Association/Popular Culture Association National Conference in Washington, DC this April. "Tim Melley, the director of the Humanities Center, mentored me for an independent study two summers ago and has played the biggest role in guiding my journey through research and planning for grad school. His focus is on postmodernism, which questions reality and asks how we can identify what is real versus what is fake. It also examines how humans interact with changing norms and advances in technology. With Dr. Melley's help I decided to specialize in contemporary and postmodern literature. "Another influence has been Tom Romano, the Heckert Professor of Literacy. I took a class with him for my education minor, and for one of the assignments we wrote about an indelible moment in our education. For me, it was when my high school pre-calculus teacher refused to help me because 'some people are better at math than others.' Dr. Romano asked me if he could send my piece to the editor at the Ohio Journal of English Language Arts, and it was accepted. It's been really incredible and surreal to see my name in print for my first academic journal publication!" Ellen Stenstrom holding the Ohio Journal of English Language Arts, in which she published her first academic article. "It's been helpful that in the majority of my English classes, we have active discussions based on reading a text, and I think that aspect is most similar to real life: synthesizing what you know, learning about the world, and bringing it together with other people. You learn how to be open-minded to their ideas and how to think and articulate on the fly. Writing is a skill that I think my generation as a whole is severely lacking at the moment. "As a UA, one of the things that we have to convince the incoming first-year students is why they need to take classes that they may not be interested in. I truly believe in a well-rounded liberal arts education, and one of the points that influenced me was a graduation speech by Steve Jobs. Talking about the work that got him to his level of success, he explained that he had dropped out of college while taking a calligraphy class, one that he didn't think would ever be important. While developing the software for the first Apple computer, though, he ended up pulling out a bunch of his old class notes and found he could integrate some of the things from his calligraphy class. This led him to developing the fonts for Apple software. You just never know when it will be helpful to utilize something that isn't directly in your job description! "I feel that knowing about more than just what you're interested in is what makes an intelligent well-functioning human being. I'm reminded of a required Miami Plan psychology class that I had freshman year, where we learned how memory works and how neurons and synapses affect our dreams. A lot of that came back in a literature theory class that I took this last spring, where we talked about how the brain recycles and keeps certain memories. It wasn't particularly relevant to a specific piece of literature, but it helped me understand what we were trying to draw from a particular literary theorist. 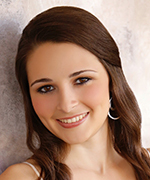 "Because of this, I rarely feel like I'm doing work for any of my classes. Whether I'm doing research for a linguistics paper on Harry Potter or studying psychology or archaeology, I'm always reminded that I'm in the right place. And I always end up coming back to my original passion of publishing a book." 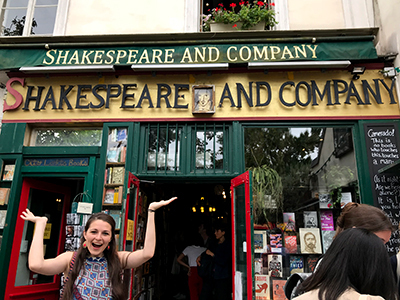 Ellen Stenstrom at the iconic Shakespeare and Company bookstore in Paris, France. "I have a lot of friends in business and speech pathology and education, and every summer they rush out to apply for internships related to their fields. In English, most internships are related to publishing, but I'm more interested in the education side. I found an internship by working with professor Katie Johnson, who ran the literature program (which is now run by Erin Edwards). Once a week we would talk about running marketing and social media campaigns for guest speakers — professors, writers, and so on. We helped market and organize the events. "This past year our big project was starting a WordPress blog: Literature at Miami, which is important for a major that does a lot of writing. The blog has become a resource for both prospective and current students to see what's happening in the Department of English. Working with Dr. Edwards, I've written several stories for it. "One of my favorite speakers that the Department of English brought in was Patrick Alexander, who is a Miami alum and literature professor at the University of Mississippi. He teaches English literature classes to inmates in a prison, working on literacy, discussing books, and building curriculums. When he visited Miami, he talked about how his experience as a Miami student helped him achieve success. His talk also addressed social justice issues and promoted potential solutions. "I'm a huge Lemony Snicket fan, and one of the coolest things that came out of this internship for me was when author Daniel Handler came to Miami for a big lecture in February 2018. As a department intern I attended a small seminar preceding his lecture, with just about 20 of us in a room, and I asked him questions about his work. My notes from that turned into a blog story, so that has been really an invaluable and fun experience." "Originally, I didn't think I'd be a Miami student and I didn't know what my major would be, but trying different things and opening up my schedule has allowed me to find my path — the English department internship, being a UA, consulting at the Howe Writing Center, doing literary research, being involved with Collegiate Chorale, and all those other things that I wouldn't have time for otherwise. "I've always wanted to feel like I have a purpose bigger than myself. I think a lot of students go through college consuming knowledge, time, food and just churning out homework and getting into the rhythm of things. To me, that's boring. What's the point if you don't at least try to leave a lasting impact? And so I want to not just consume my college experience but create and give back something to my fellow students, maybe helping them figure out their own journey. "No matter how hard you try to plan for the future, crazy stuff happens. And that's okay, because the right people and circumstances will come into your life at the right time and things will fall into place the way they're meant to. You may not be where you thought you wanted to go, but you will end up where you need to be if you keep your eyes and heart open to new opportunities!"